A high search engine ranking would be a measure of a website’s popularity in the search results. To achieve this, businesses needs to do a lot of work. Time is a significant factor when it comes to SEO and developing a quality product. There isn’t sufficient time to concentrate on both of these. The best thing to do here is to outsource your digital marketing responsibilities to an SEO company specialised in pushing your rank up in the search engine results list. Creating fresh and interesting content would lead to regular readers engaging your work with loyalty. One of the techniques to consider here is the tweaking of your existing article, giving it a new touch and changing the perspective of the article would make a big change in the SEO rankings. Stuffing of irrelevant keywords would decrease your ranking, so its recommended to choose only appropriate keywords. Trying to compete with highly competitive work would not fetch any results. How do you know whether the key word is competitive or not? The number you are looking for is the number of results displayed just above your search results page. If this number is more than 75,000 then it is better to avoid them and focus on smaller numbers. A keyword with less competition should have minimum word traffic (greater than 0). You can either write new articles using these keywords is you can tweak your old already published article. This doesn’t mean that your article should depend on the keyword, find a way to connect the keyword to your articles making it useful, relevant and interesting. You can use the same keyword in titles, sub titles as well. 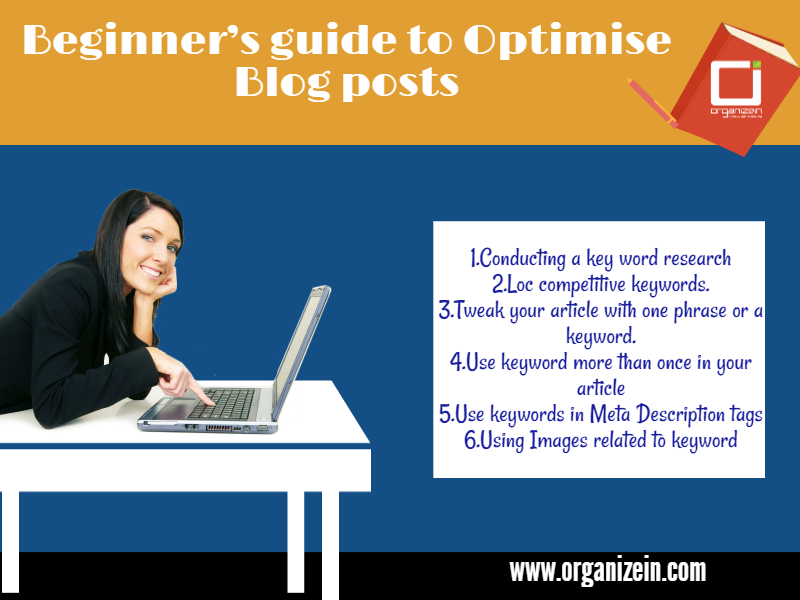 Using keywords more than once in your article would boost your content up in the SERP. This doesn’t mean that the keyword should be used unnecessarily. Make it relevant to the topic or use very near synonyms. Using it in a smart way would help you optimise your page much better. Keywords in your meta description will not help you get a higher ranking but including them in meta description, Google would highlight that word in the search results and thus encourages people to click on your page. Having a visual description of any topic makes it more interesting. Same ways, if you include images related to your keywords and use these keywords in the description of the image. It is difficult to maintain your business and focus on coming up with new content for your blogs or websites. When it comes to SEO experience and skills matters a lot. Therefore businesses hire SEO companies and give them the full responsibility of digital marketing. Hiring talented companies like Organizein will make your business much popular in the virtual world. The company is expanding and growing. They recently launched their services in Phoenix, Arizona. An SEO company in Pheonix known for its unique techniques of digital marketing, their services would satisfy all the stakeholders.